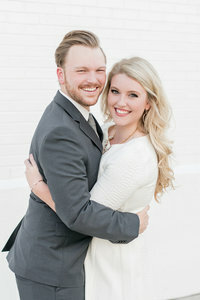 Lauren and Chris celebrated their anniversary with us in downtown Birmingham. We met the happy couple at the RAWWBEAUTY studio where Lauren got makeup and hair done by the incredibly talented Jackie and Cassandra. Lauren looked stunning in her two-piece Badgley Mischka dress while Chris rocked a charcoal suit and navy polka-dotted bow tie (LOVE! ), and we spent the next couple of hours were spent strolling the streets of the burgeoning downtown area. Lauren and Chris are such an awesome couple, and we’re grateful that they chose to spend their afternoon with us celebrating their love! LOVE LOVE LOVE!!! They totally rocked their session and man her dress!!! She’s stunning!!! LOVE this session! They look absolutely amazing, and so so soooo in love! Oh I love this session!! Their outfits are perfection!!! Great job guys! Gorgeous couple and her dress! Great job on this session! Oh my goodness, that blue sparkly gown! ???? Swoon! Get out of here!!! Everything about this shoot is just perfect. The couple is stunning, the lighting is gorgeous, the outfits are incredible. Beautiful job as always! WHOA!!! This is jaw dropping!! Obsessed. What a gorgeous couples anniversary session! Her dress is amazingly gorgeous & I’m swooning over that red wall. Amazing session!! Love the outfit choices!! WOW!